Image © 2009 – Galatee Films – Pathe Production – Notro Films – France 2 Cinema -France 3 Cinema – JMH/TSR. All Rights Reserved. Oceans Review By John C.
Early on in the film Oceans, this year’s Earth Day release from Disney•Nature, we see an image of a rocket being launched, as viewed through the eyes of a sea iguana. We immediately get the message: why do humans have an obsession with exploring the depths of space, when much of Earth, especially that hidden underwater, has yet to be discovered? The large amounts of fuel are just polluting our waters, but the images of earth from space are constantly changing our perspectives. Showing numerous different types of fish, dolphins, whales, seals, and many other underwater creatures, Oceans is stunningly beautiful, and best enjoyed on a big theatre screen. It does not bombard the audience with facts and statistics that may or may not be remembered on the way home, but rather lets the images speak for themselves. We don’t need to be explicitly told not to pollute, when we see an image of a seal interacting with a shopping cart that should not be on the ocean floor. Perhaps because it’s channeled through Disney we are able to look at these images with wonder, rather than constantly being asked ‘what have we done?’, or worse being told it’s too late. It’s not too late to make a difference. Pierce Brosnan only rings in as narrator to inform the audience of types of species and minimal facts, but even the beautiful score by composer Bruno Coulais takes a break so the audience can enjoy the vocalizations of a dolphin, or the calm flow of water. As a movie, it’s at least as good as last year’s Earth. In other words, it’s excellent. It’s a rare and wonderful thing to find a nature documentary this good. Oceans is truly magnificent for people of all ages. Go see this one for Earth Day, and marvel at the beauty of the planet on which we live. Oceans Review by Erin V.
Like last year’s Earth Day release, (Disney•Nature’s Earth), Oceans is as stunning and accessible to all ages. Attached to the film is also a trailer for next year’s Earth Day movie, African Cats. Unlike some documentaries, I was not bored by Oceans. I did find it very relaxing at times, but not boring. I was still enjoying watching it all on the screen. What I find is that this kind of documentary rides more on images than bombarding you with information. I loved getting a look into another part of this world which we live on, that is not normally seen. Underwater there is so much going on that we don’t think about, like armies of little crabs facing off, or the strange fish that roam there. Did you know that there is a ‘stone fish’ that looks like the made-up ‘Gronkle’ in How To Train Your Dragon? While I can’t possibly name all of the animals shown, I will mention that there are also shots of seals, walruses, polar bears, and penguins, more of my favourites. One shot that is absolutely endearing is of a mother walrus cradling her baby in the water. A beautiful, and strange one is of a blanket octopus ‘flying’ by. I also want to note the music in Oceans. The score was done by Bruno Coulais (Coraline), and really fit and added to the images. Such as in the boat/waves scene I mentioned earlier. I’ll have more in depth on the music in the coming days. Overall, this is a beautiful film that deserves to be seen on the big screen. Also, like with Earth last year, proceeds from ticket sales for Oceans will go to environmental charity groups, so try to get out to see it in theatres. This is a great film to take the whole family to for Earth Day. Second in a new series of DisneyNature films, Oceans introduces children to the beautiful undersea world. One small boy’s question of “what is the ocean?”, become the basis of this documentary. This film introduces children to many wonderful creatures, from pods of dolphins catching fish in bubble nets, to majestic humpback whales. Graceful beauties abound, from ribbon eels to blanket octopus, leafy sea dragons, and schools of jellyfish. From fish to sea lions to orca whales, the underwater circle of life goes on. A group of baby turtles hatch, but only one escapes a flock of hungry gulls. But while wild animals face natural threats, their greatest threats come from humans, in the form of bycatch, climate change, and pollution. We see some of the people who are trying to help, including a researcher who has a peaceful encounter with a great white shark. Oceans a beautiful film. The underwater footage, as well as the satellite imagery of the ocean, is just spectacular. The score by Bruno Coulais complements the visuals perfectly. Oceans is the perfect film to bring the family to for Earth Day. 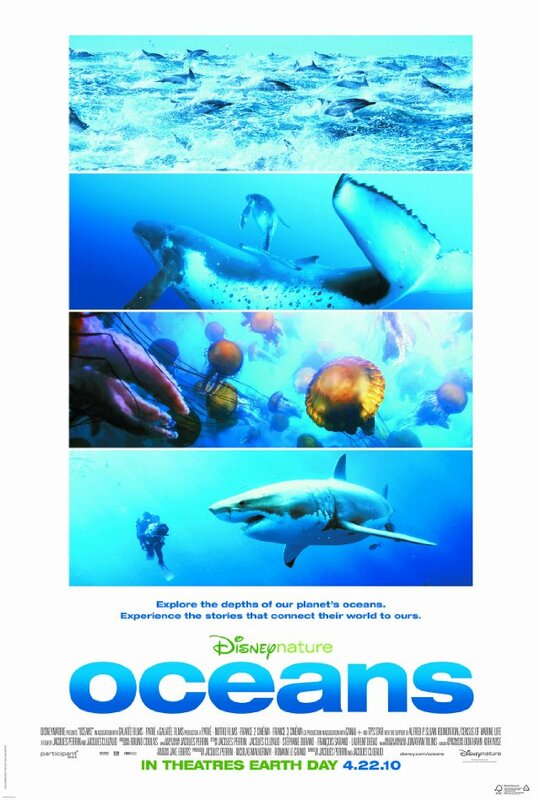 Oceans is DisneyNature’s second movie in honour of Earth Day. Last year’s movie, Earth, highlighted creatures around the world. This year’s movie, Oceans explores a part of our planet that is a world of its own. And what a beautiful world it is. Oceans opens with children playing near the ocean and the narrator, Pierce Brosnan asking “What is the Ocean?” and stating “To know the ocean you have to hear it, see it, taste it, feel it’s power. You have to live it.” That’s exactly what this beautiful movie does. It allows the viewer to have a wonderful visual and auditory experience, to live in the ocean for 85 minutes. The photography is stunning throughout the entire movie. There are several scenes where the screen is literally filled with fish, or diving dolphins or birds. Teh effect is magical. There are also several beautiful water surface to sky shots, scenes of moonlight filtered water and amazing closeups of all kinds of creatures. The range of ocean creatures in this movie is breathtaking. There are silky looking blanket octopus, ribbon eels, razor fish and garden eels doing a vertical ballet, majestic humpback whales, graceful dolphins, orcas, sea lions, numerous fish and birds to name only a few. The breathtaking visuals in Oceans are matched by the absolutely wonderful score by French composer, Bruno Coulais. Seeing Oceans in theatres is a wonderful way to celebrate Earth Day. While it also will be beautiful on DVD, the big screen makes it spectacular. Happy 40th Earth Day. Oceans is the 2010 Earth Day documentary from DisneyNature. Last year’s film, following the lives of four land species, drew criticism for recycling segments from the British Planet Earth series. For those of us without Discovery Channel seeing the footage for the first time, this seemed a bit unfair, since it was good stuff regardless. Oceans comes from a different source. Starting with the Calypso voyages of Jacques Cousteau, inventor of the Aqualung (better known by the acronym SCUBA–self-contained underwater breathing apparatus, as Lloyd Bridges would explain every week on Seahunt), the French have been making marine nature films for decades, so it was natural that they would provide the source material for this one. Rather than concentrate on just a few species, Oceans touches briefly on many more, from the smallest diatoms to the biggest whale. Aside from a few land scenes of hatching turtles and colonies of lizards, birds and seals, there is mainly spectacular underwater footage, coming up for air along with the marine mammals and diving birds. Some memorable surface images include hatching turtles, dolphins leaping and spinning in the air (without human incentive), schools of fish forming spheres and vortices as they evade birds and predators up the food chain through seals and orcas. Panning the enormous length (about 25m) of a blue whale brought back memories of my own sighting (in the St. Lawrence Gulf). Fishes share the lower depths with a dazzling array of invertebrates, including crustaceans, molluscs and jellyfish, all with fascinating ways of eating and avoiding being eaten. Narration by Pierce Brosnan had just enough detail to keep it interesting, and the fine musical score never interfered with the rich array of natural sounds. However, despite the great variety of images, the film dragged a bit at times, seeming longer than its 84 minutes. As a bonus, once again with the closing credits we were treated to images of the film makers at work with their underwater cameras, lighting and other gear.